A well-designed landscape will add curb appeal and increase the value of your property and the appearance of your business. Whether you want to create landscaping for a new house or you’ re giving an existing landscape a new look, it is well worth the investment. For years, our team members have worked together like a family to build client relationships and create truly exceptional landscapes. 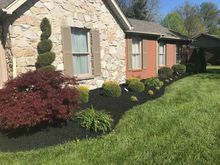 Green Thumb Lawn & Landscape is your one-stop shop for designing a landscaping plan, implementing it, and caring for your landscape. Our landscape design process begins with an onsite consultation or a telephone conference. We will discuss how your landscape will be used and your style preferences. We will provide practical ideas that will work for country, suburban, or city landowners who want to create an attractive landscape. Our landscape designer will then take measurements and digital photos to begin drafting the landscape design. Using state-of-the-art design software, a master plan is developed. The master plan takes into account the environmental condition of the property, the client viewpoint, and the elements and principles of design. With the master plan, we will be able to show you the main elements of the design before we start the landscape renovation. We understand that the landscape you choose will be with you for many years to come, thus we work hard to ensure that you are provided with a beautiful, professional design. 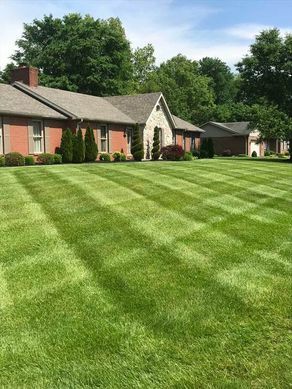 Whether you’re a Central Kentucky resident or business, let Green Thumb Lawn & Landscape design and build your dream landscape.